The next upcoming Christmas Eve is on Tuesday December 24th, 2019. Christmas Eve falls on December 24th each year the day before Christmas Day. It is a Christian celebration with some countries honoring the day as a public holiday with government and business offices closed. Some countries have Christmas Eve as a public holiday and others give their people half the day off to allow them to go shopping for gifts and groceries and take care of other things to prepare for the Christmas celebration the next day. Many people will have a celebration dinner and or attend parties with egg nog and lighted and decorated Christmas trees. 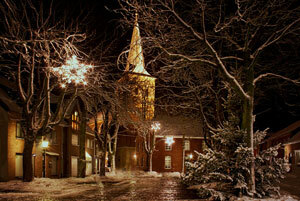 It is tradition in some catholic countries for people to go to mid-night mass in honor of Jesus Christ's birth. Christmas Eve is the day before Christmas that celebrates the birth of Jesus Christ and ends the Advent Season. People have been celebrating this day ever since Christmas day was celebrated.